The HBsAg test checks the hepatitis B surface antigen blood level. What is an HBsAg test? The HBsAg test measures hepatitis B surface antigen blood level. Why is an HBsAg test important? The HBsAg blood test is the earliest indicator of a hepatitis B virus infection. This HBsAg Test is a blood test. The HBsAg test, also known as an HBsAg blood test and a hepatitis B surface antigen test, measures the HBsAg blood level. The hepatitis B surface antigen blood test is used to check for a hepatitis B infection. After an exposure to hep B through contact with the body fluids of an infected person, the blood will start showing evidence of the infection through measurable levels of Hep B surface antigen. In contrast to the hepatitis B titer which checks immunity secondary to a prior vaccination, the HBsAg blood test is used to check for an actual infection. This hepatitis B surface antigen blood test is particularly helpful as it is the earliest indicator of the presence of a hepatitis B infection. The HBsAg test is included as part of the STD test panel for STD screening and also used for pre-employment lab testing. The HBsAg lab test also ordered as part of the MMA blood panel used to screen people who plan to fight in combative sports like mixed martial arts or boxing. To get an HBsAg test near, order online and get tested at the selected Quest Diagnostics lab. 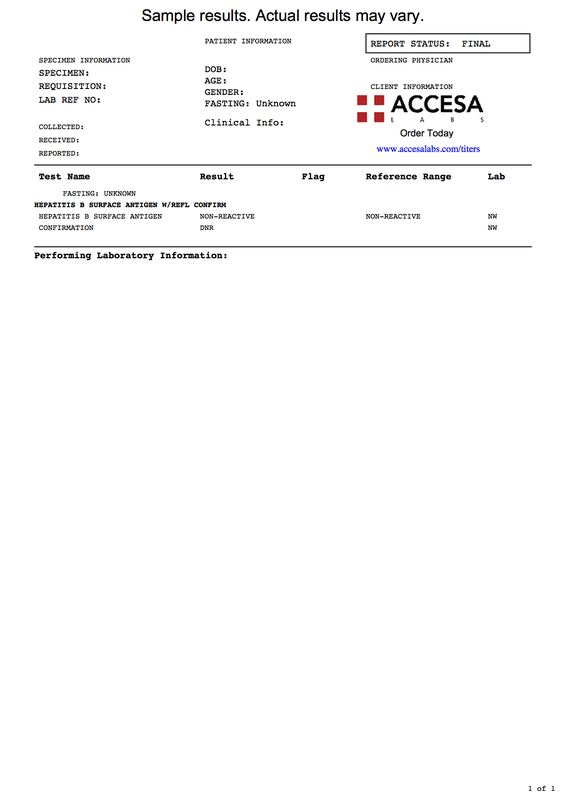 Once your HBsAg lab results are ready, they will be available for download. As can be seen on the sample HBsAg lab report, the HBsAg blood level will be reported as non-reactive if no hepatitis B surface antigen is detected by the lab. Typically, a negative HBsAg means that the person does not have hepatitis B. However, there are windows of time during an early hepatitis B infection when hepatitis B surface antigen will not be detectable. Does an HBsAg test need fasting? Generally not. However, one should fast if one is planning on getting other blood tests that do require fasting at the same time as the HBsAg level test. HBsAg Test at Guaranteed Prices.